If we were having coffee this morning I would tell you how much I have missed sharing posts in the Weekly Coffee Share, and bid a Happy Mother’s Day to all the moms. If we were having coffee, I would share my heart with you today. On this Mother’s Day, I miss my mom, who sits in her wheelchair in a nursing home a few hundred miles from me. Further inspired by the weekly photo challenge Earth , I was reminded of Mother Earth and immediately thought of the mountains and the ocean. My mother went to great lengths to make sure we regularly visited the beaches of San Diego as well as the trails of Tuolumne Meadows in Yosemite. Places that are impossible for her to visit now. I am not a writer of poetry, but I was able to scratch this out on impulse. Feet that touch the ground no more. Her favorite places still long to feel the touch of her feet again. If we were having coffee, my wish for you is to enjoy your Mother’s Day, however that may be. So sad Terri loss of memory is such a cruel thing.. hope that some days she manages to remember all of those wonderful things she did. At least you can remember for her and jog her memory. Thank you! It’s amazing what she does remember, you know, the important events and her family. This was just a beautiful, touching tribute, Terry. I really relate. So sorry you have ‘lost’ your mom to dementia. It is a different sort of loss, only fully appreciated by those who have shared this experience. My mother died before she entered this realm, but I believe she may have done so had she lived long enough. There were signs. Lovely poem and lovely post. Thanks so much, Faye, and for all of your generous comments today! That poem made me cry. Life is so transitory and can be really sh*tty at certain points. I guess the bright side is that you had the time that you did with your mom. Sounds like she was an amazing lady. I have a few friends that have lost their mom’s to dementia and it is never pretty. Glad your dad is still going strong and that your daughters have you. When I wrote it from that perspective, it made me sad also. My mom is still alive and remembers enough so that if we tell her we went to Yosemite, she says she wishes she could go. At least I get to take my dad back to Yosemite in July for his 80th birthday!! It’s good to sit on the bright side of this situation as the dark side is really dark sometimes. I am a July birthday gal (15). What day is your dad’s bday? 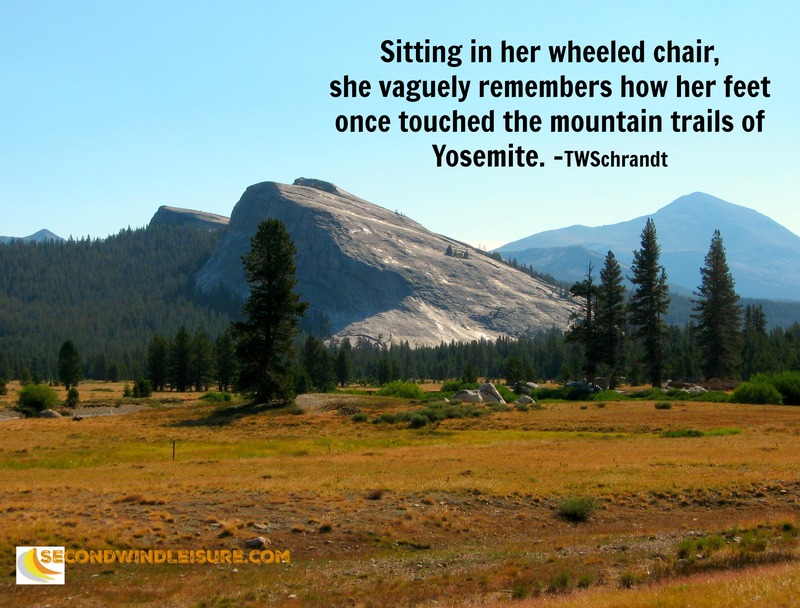 I’m glad you are going to go big for his 80th – what is better than a trip to Yosemite?!? Wow, my dad’s birthday is the same day! What a coincidence. I will toast you at the same time as my dad! A lovely tribute to your mom Terri. So sad. Mothers day is not sweet and happy for everyone. We are thankful though. Thank you, Kathleen, my mom did have a nice day with my brothers but she won’t remember a thing. I, on the other hand, had a wonderful time with my daughters! Hope yours was great! A lovely poem for your mum, Terri. I’m so sorry she can no longer feel those wonderful places. I hope you both had a great Mother’s Day. Here, in the UK, we celebrate Mother’s Day in March. It was a tough day this year as it was the first one without my mum. I still sent her all my love though and I could feel her smile. Beautiful tribute. My mother went to great lengths as well to make sure we had experiences to help us love the earth. Thank you, Moms are important for that! Our Mom’s are so special, what a sweet tribute to your mom. It is so difficult to watch aging parents struggle. I hope you had a lovely Mother’s Day! Awww, what a sweet and sad poem. I learned my love of nature from my mother too and have many great memories of our days camping together as a family. Happy Mother’s Day – I’m glad that you get to spend it with your daughters. Thank you, Kathy! Regardless of our relationship she always had our best interests at heart and loved us! My Mothers Day is wonderful and Happy Mothers Day to you! Lovely poem. I understand what it’s like since my mother has Alzheimer’s. She will actually be 96 this week, but doesn’t even know it, who she is, or even that she is a mother. I hope you enjoy your Mother’s Day! Hi Doug, thank you. I remember one of your posts about your mom. Somehow she know deep down. I am enjoying visiting both of my daughters this weekend. Happy Mother’s Day to the ladies in your life! Beautiful poem, Terri. I have been in your shoes. Enjoy your Mother’s Day! Iblove the pom to your mMother. My love nature and the family usually went to Rock Bar, Idaho, now a ghost town. for reunions. My love nature came from my parents. Thanks, BettyLouise! You have a love of leisure and the outdoors and I’m glad to know your parents influenced you! Hope you are having a wonderful Mother’s Day! Beautiful photo and beautiful poem, Terri! Bless your mother’s heart. Sounds like she has had a life well lived! Happy Mother’s Day, Terri! Aww, thanks PJ, her health declined way too young. Enjoy your Mother’s Day! Even with dementia, bet she can still tell the old stories. Nice poem tribute to her. Yes, she can remember and it’s hard to tell her that we went recently without her feeling that longing. Thanks, Janet!